It’s a late summer night. Monday, day after the weekend. I should go to sleep, but I cannot. So I’m just sitting, drinking tea and listening to Bonobo. The windows are wide open, the chill of night slowly drives the fiery sun out of the room. On table steam arose from the cup of tea. It’s my favorite – four years old Yi Wu pu-erh, one that just left the ferocity of youth, one that started to ascend the devious road to maturity. 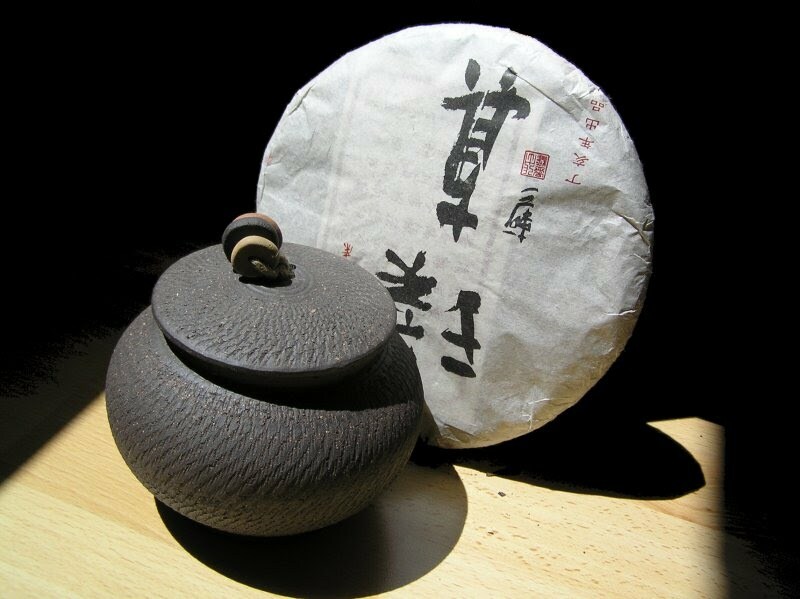 Born from mountains of Yi Wu under skilled hands of tea crafters. 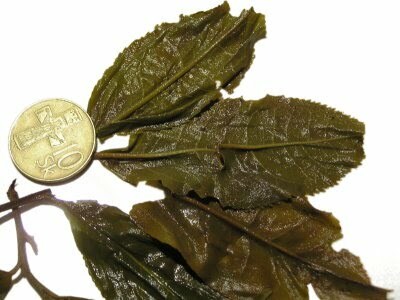 I know that this tea is hand made – just today I found a long black hair in it. I quickly disposed it, before my girlfriend starts to ask hard-to-answer questions. This is one of the first beengs I bought from Guang long, long ago in January of 2007. That is past long gone, the ancient time before the pu-erh bubble exploded. And this is the first whole beeng I drunk and shared, except of last small chunk. The seventh infusion does not loose it’s strength nor taste. The rafined sweetness of Yi Wu shows promises of what it would become if I hadn’t drunk it. If I could just wait another fifteen years. But it’s hard to resist. Last chips of formerly half kilogram beeng are observing me from wrapper. It’s a farewell to a good friend, farewell that leaves memories of beautiful times. 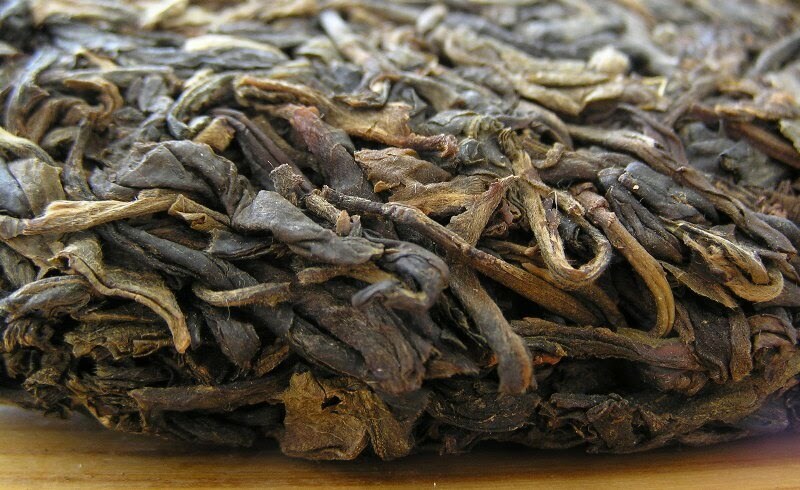 This is second of the two limited production autumnal pu-erhs of Xi Zhi Hao tea factory, sold by Hou De. 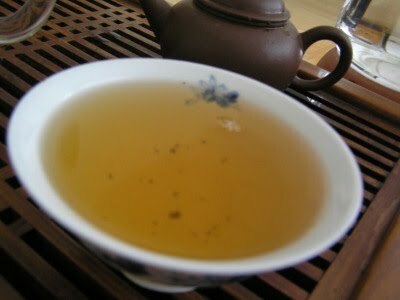 I liked the first one, the Da Xue Shan, although the character of that tea was very unusual. Very green and floral with sweet flowery taste. 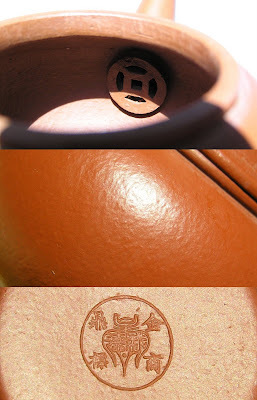 The Pu Zheng beeng is similar to Da Xue Shan – beautiful, compact but not over molded, nice piece of craftsmanship. The leaves are easy to loose; I used ones from the jar filled a week ago. The leaves are big, bold and whole. The tea brews yellow, thick and fragrant liquor. First few cups taste a bit smoky, but the smokiness disappears in later infusions. The tea is strong but not untamed, the crystal clear liquor calmed my head and slowed the time running by. An enjoyable pu-erh, though a bit pricey. The leaves are huge – I found lots of them long nearly 10 centimeters. I took the picture with biggest Slovak coin (slightly more than 2 cm in diameter). This tea was also drunk by Hobbes. It’s quite rare to see more than two or three years old beengs on sale. And if there are some at least partially aged beengs, they are either quite expensive or faked or both. 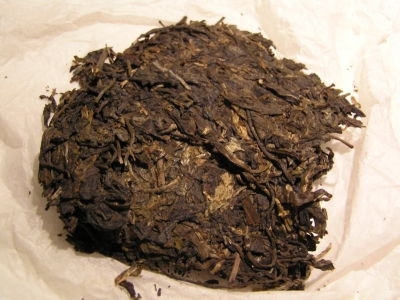 One of the sources selling excellent pu-erh for, unfortunately, excellent prices is Hou De Asian Art. This is where I got this beeng, too. Marketed by CNNP - China National Native Produce – this classical recipe 8582 beeng is special order using semi-wild arbor trees. Semi-wild means, that the tea trees were originally cultivated, but then they were abandoned and only the nature took care of them. Also, the beeng is made before 2003 - that means, that the trees were probably neither overharvested nor overfertilized. You can see how beautiful the beeng is. Compact but not too much, unlike the hydraulic pressed 8582 beengs like 2007 Xi Zhi Hao 8582, this one is airy and the beeng can be easily broken. I was finally able to start the Lightbox to work, so please feel free to click the pictures. The liquor is clear, slowly turning into orange. What I like the most of this beeng is the smell in the aroma cup. Exotic wood, spices, touch of pine needles. The aroma lasts long, I can still feel it even after an hour. It’s complex yet easy to savour. The woody character quickly turn into more floral. Unfortunately, the tea can easily become sour when prepared without enough care. Two days ago I bought in Prague two tea jars. Sometimes, when I decide to drink some tea I do not have patience to break the beeng into separate leaves, so it will be nice have some favorite tea already broken. I decided to work on some lightly pressed beeng. My choise is 2007 Xi Zhi Hao Pu Zheng Yuan Cha sold by Hou De. The beeng is slightly more compact than the Da Xue Shan of the same producer was. The signs of stone molding are yet clearly visible and maybe except the center where the knot was the whole beeng could be flaken without damaging the leaves too much. Just with my pu-erh knife and lot of patience I start to work. Carefully prying the beeng, leaf after leaf, just like when I collect tea enough for gong fu cha, except that this time I’m trying to dismantle a whole beeng. One hour later the jar is full and still more than half of the beeng remains. But I do not want to break the precious leaves in the jar, so I have to stop. I got this teapot about a year ago from Guang. A sad story, this is a replacement for pure zhu ni teapot that cracked – maybe I poured too hot water into it in cold room, maybe the teapot was cracked before, I don’t know. But this new one serves mi fine for more than a year now. This teapot is quite unique amongst my teapots. It’s rather old, being at least twenty years old. 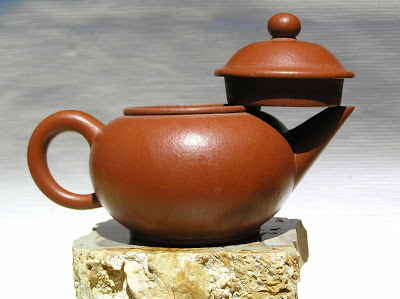 Also, the knocking sound of this teapot is highest from all of my yixing proving the high quality of clay. The dark orange color, wrinkle lines and oily surface points out, that this clay is zhu ni, or it’s at least very similar to zhu ni. The filter. I never saw a teapot with filter like this – a circle with small square connected with four diagonal dashes. The bottom seal is very artistic, too. Certainly, this teapot has some flaws. The lid does not fit perfectly and when I fill the pot with too much water it leaks. Also, maybe because of the unique filter it pours rather slow. And the size is maybe too big for just me. 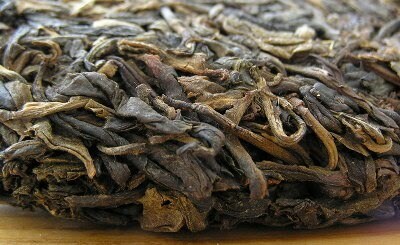 Yet, I still use it for young sheng pu-erh. 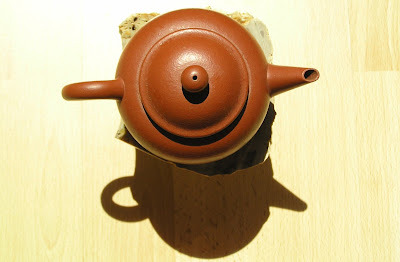 I like the clay; I like the tea this pot makes. I feel somehow connected with it, just like with my other teapots I use. I like it because it’s nearly as old as I am. Well, ok, I’m older than this pot, but not too much. So when evening comes and I know, that I will drink more tea than one session of gong fu from smaller teapot can provide, I choose this one. Sometimes one have to take a route different from the usual to find something one and exciting. To see something overlooked and experience something new. Few days ago when I went to work I decided to turn left few block earlier and I noticed a building with most interesting reliefs. Reminding me of Sumerian reliefs they are nice and well hid examples of culture called Socialistic realism that survived last twenty years nearly intact. Usually I buy more tea than I’m able to drink. When I see something new, tasty and exciting I cannot resist and I purchase an ounce or two to drink it. With pu-erh there aren’t problems, pu-erh can survive quite long time and even improve. Bud especially green tea and anxi oolongs go stale really quick and drinking them next year after a purchase isn’t a welcome experience. Since summer is here and temperatures close to those ones on the surface of the Sun, I decided to prepare some stale oolong and green teas as Ice tea. Fill the plastic bottle with water and pour some tea into it. Place the water with tea into refrigerator and leave it for 6-18 hours. The refrigerator protects the tea leaves from yeasting. The water turns yellow or green, depenging on tea used and the beverage is ready to enjoy. 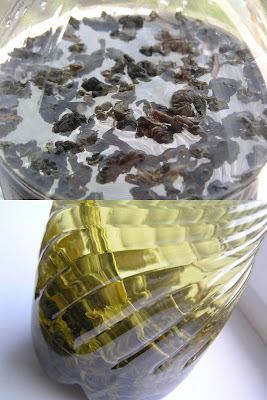 On these pictures I used Fo Shou (Buddha's hand) oolong tea. You can freely experiment with different amounts of tea, infusion times and different tea types. The resulting liquor is mostly a very pleasing and thirst slaking experience.